We are so excited to be able to offer a talk and signing with a legend in the comics industry. 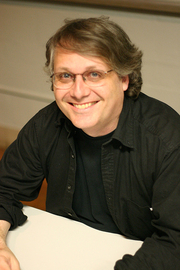 Scott McCloud is the award-winning author of Understanding Comics, Making Comics, Zot!, and many other fiction and non-fiction comics spanning 30 years. An internationally-recognized authority on comics and visual communication, technology, and the power of storytelling, McCloud has lectured at Google, Pixar, Sony, and the Smithsonian Institution. Now he’s visiting Schuler Books to talk about his newest release, the graphic novel The Sculptor. David Smith is giving his life for his art—literally. Thanks to a deal with Death, the young sculptor gets his childhood wish: to sculpt anything he can imagine with his bare hands. But now that he only has 200 days to live, deciding what to create is harder than he thought, and discovering the love of his life at the 11th hour isn't making it any easier! This is a story of desire taken to the edge of reason and beyond; of the frantic, clumsy dance steps of young love; and a gorgeous, street-level portrait of the world's greatest city. It's about the small, warm, human moments of everyday life…and the great surging forces that lie just under the surface. Scott McCloud wrote the book on how comics work; now he vaults into great fiction with a breathtaking, funny, and unforgettable new work. Scott McCloud, 24 Hour Comics. Scott McCloud is currently considered a "single author." If one or more works are by a distinct, homonymous authors, go ahead and split the author. Scott McCloud is composed of 7 names. You can examine and separate out names.